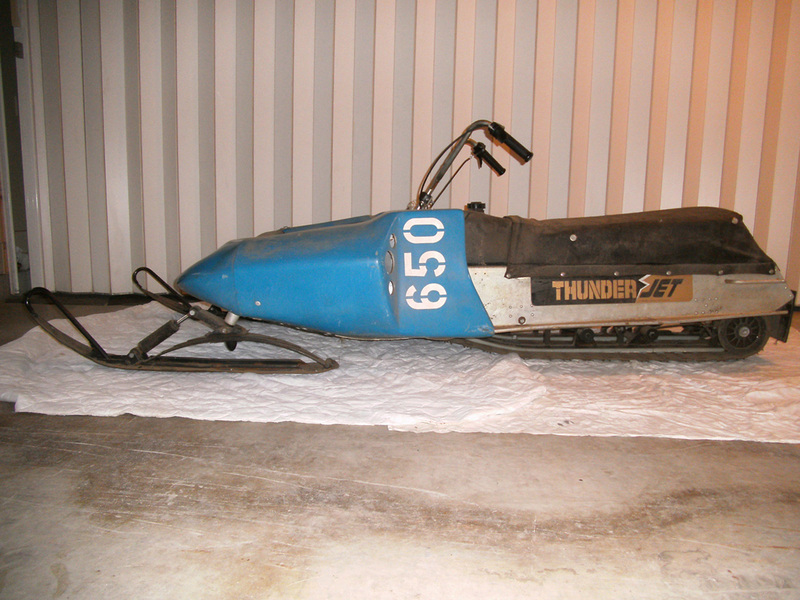 It was the winter of 85-86 when I first met Buzzy, owner of a snowmobile dealership in Vermont. 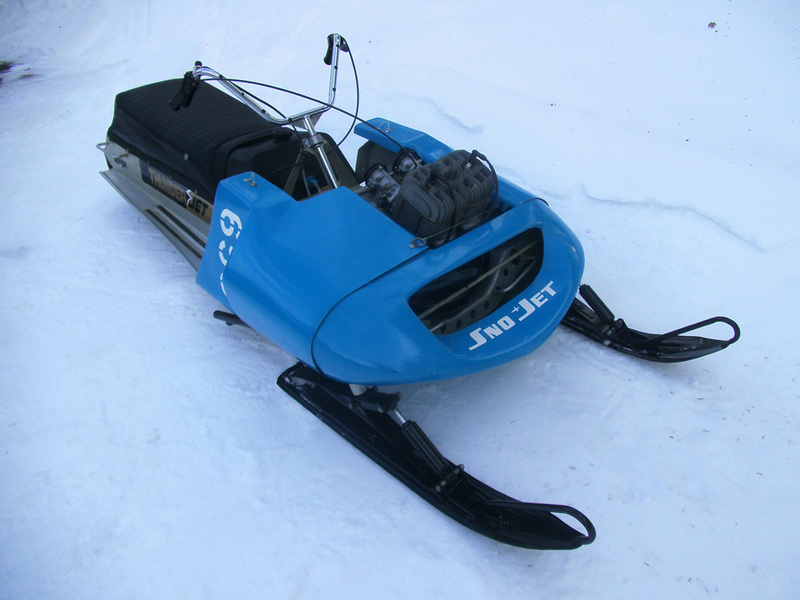 During 69-76 he sold new Sno-Jet snowmobiles. 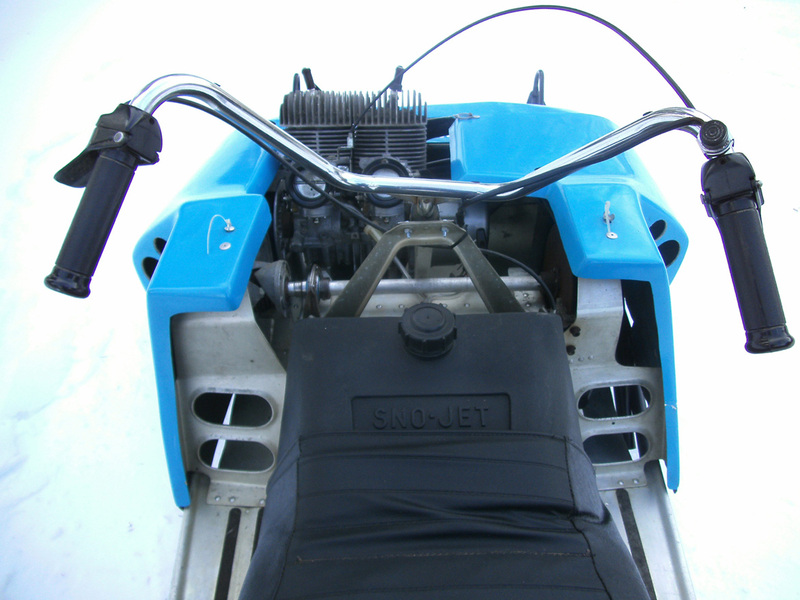 Over the years, Buzz and I swapped a lot of snowmobile parts and sleds back and forth and we would often talk about older models and the conversation always ended talking about the good old days of snowmobiling. In one of these conversations Buzzy told me that he had bought a 72 Thunder Jet 440 and 650 in the fall of 71 from the Sno-Jet warehouse in Manchester NH. He said he sold the 440 to a fellow who raced but never sold or used the 650. He just put it away in his garage and basically forgot about it. 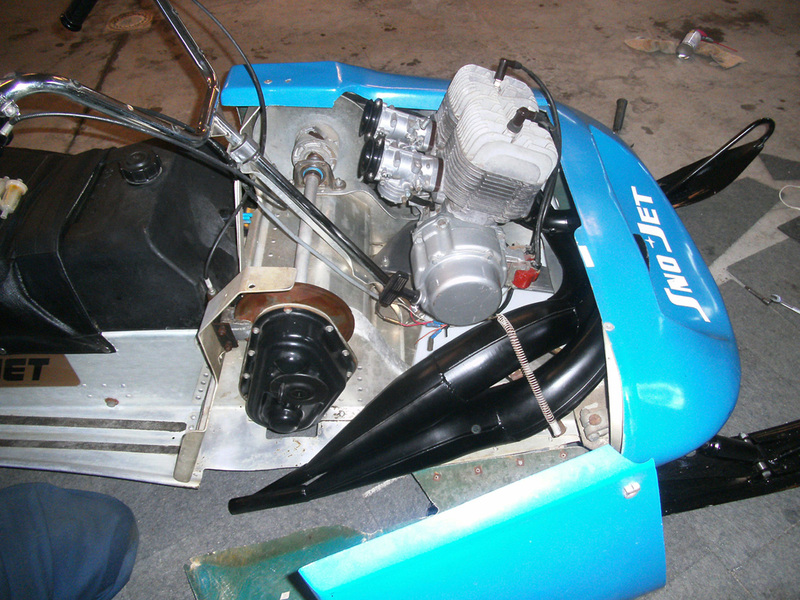 As the years went by every time Buzzy and I spoke I always asked how the old Sno-Jet was doing. He would laugh and tell me it still sitting in the garage collecting dust. I always wanted to go see it but I never did. Fast forward 28 years. 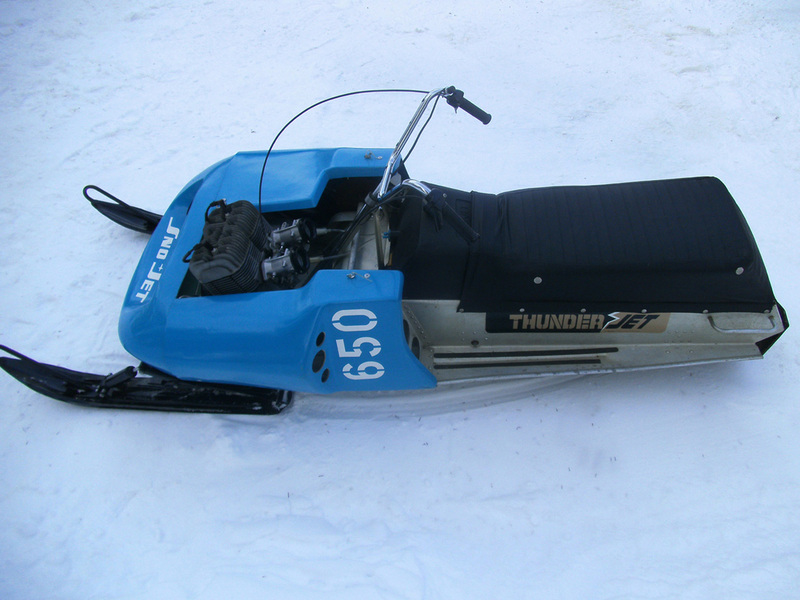 As fall was approaching and thoughts of snowmobiling were running rampart in my mind I began to wonder to myself if Buzzy still had the 650. Not even knowing if he was still around as by now he would be in his 80’s. I picked up the phone and called him. Buzzy answered the phone in the same manner as he always did and after some how do you dos; I asked if he still had the sled. He said, “Yes, and it is still in storage.” I then asked if I could come down and take some pictures of it. 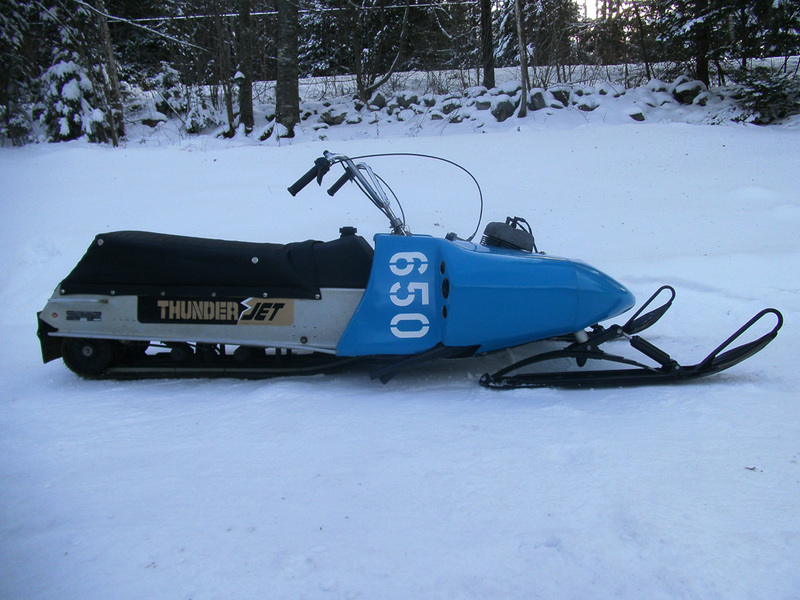 He welcomed me down, so the next weekend my wife Lise and I drove to see the sled. Anticipation was growing, because after knowing about this sled for over28 years, I was finally going to see it after all this time. It was even a miracle that Buzzy still had the sled. As we met Buzzy at the door and after some welcoming gestures, he led us into his garage. 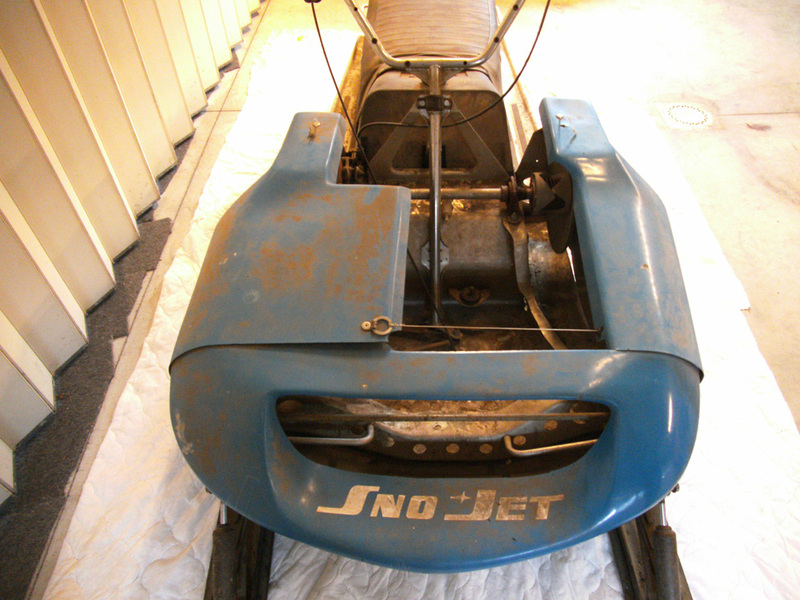 There it was, a 1972 Sno-Jet Thunder Jet 650 sitting quietly in the corner covered with 42 years of dust and grime. As I was taking pictures and talking to Buzzy about the story of why he never sold it, my adrenaline started pumping and my heart began racing. 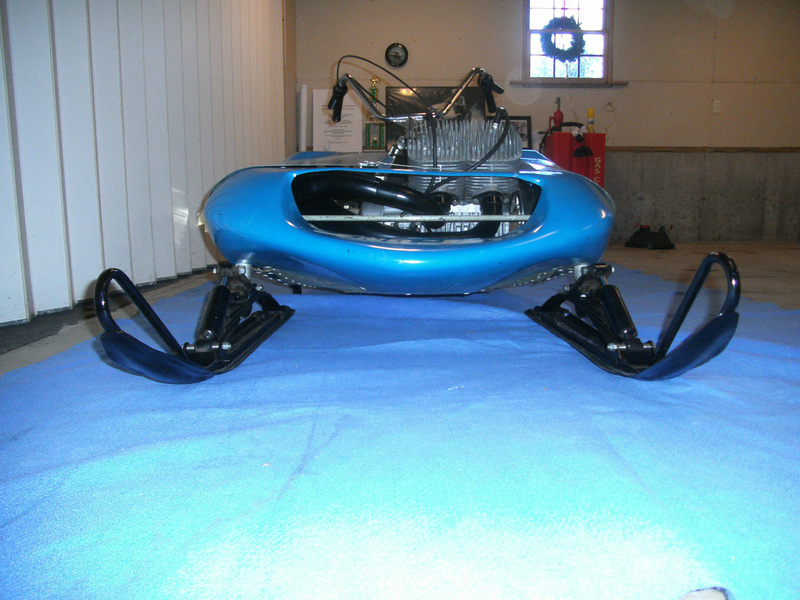 After all this time of knowing about this sled, I was actually looking at it. 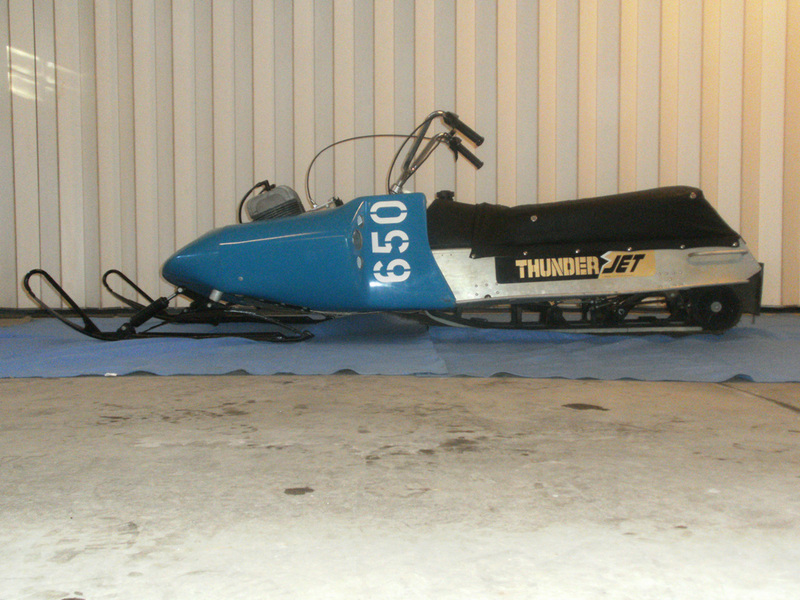 It is pretty rare when someone tells you of a sled and then after 20 something years go by and you finally see It. This doesn’t happen to me anyway, but today it did. Wow! Then out of nowhere, Buzz says, “If you want this sled, it’s yours. I know you will take care of it and I am ready to let it go. Over the years many people wanted to buy it, but I was saving it for you.” I could not believe what I just heard. I looked at my wife in disbelief and replied back, “Really?, sure Buzz, I will buy it from you.” He didn’t have to ask me twice. So after some negotiations we loaded up the sled. I could see some tears in Buzz’s eyes as we said our good byes. For the first time in 42 years his sled was leaving his dealership and going to a new home. He finally had delivered his last sled. 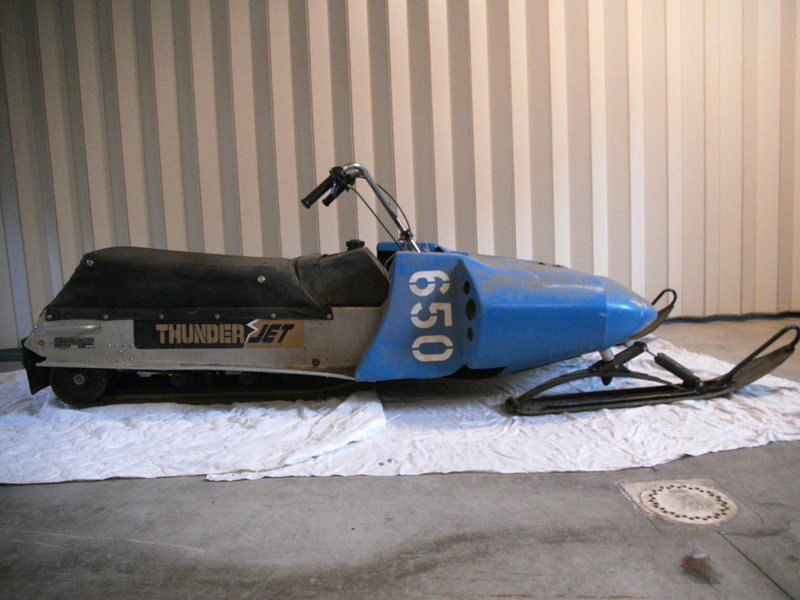 After a month of careful cleaning 42 years of accumulated dirt and grime the sled looks amazing. 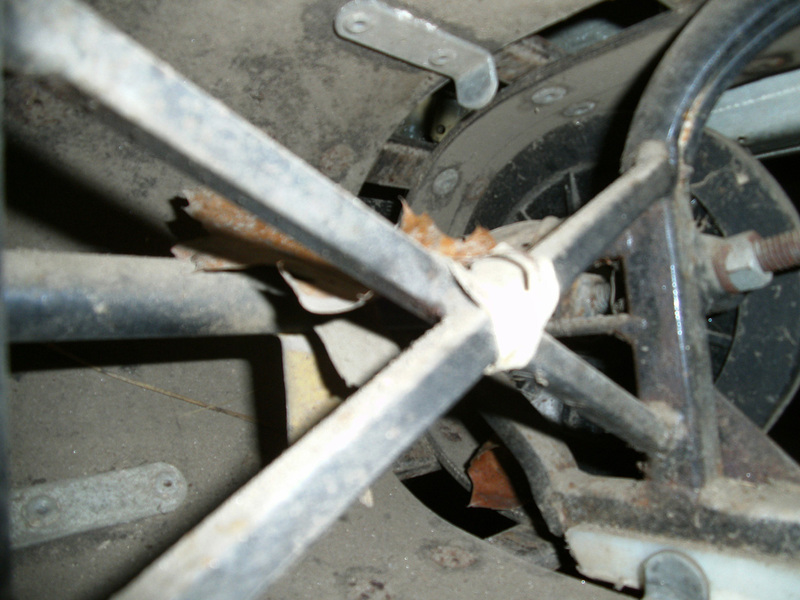 The seat cover is in excellent shape as is the fiberglass. 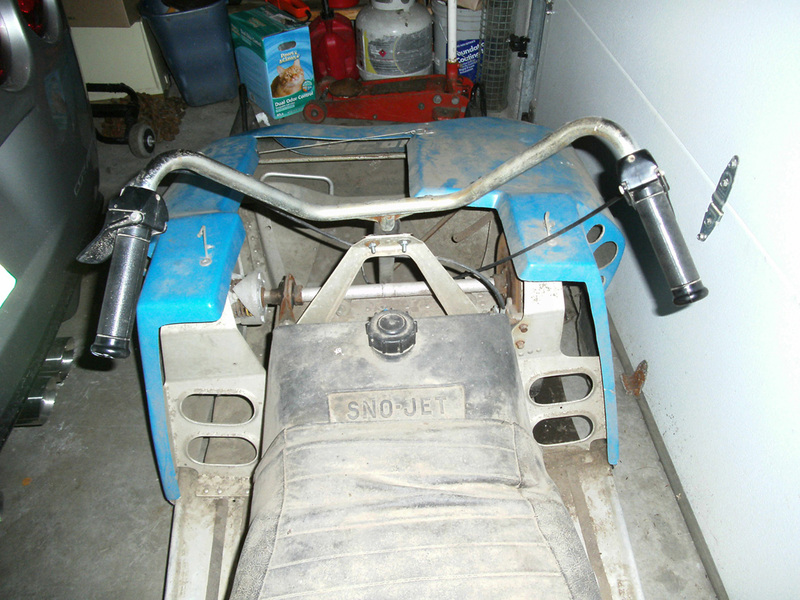 Even the motor cases and carbs are not tarnished. The yellow tinted windshield was never installed; it still has the protective plastic on it. 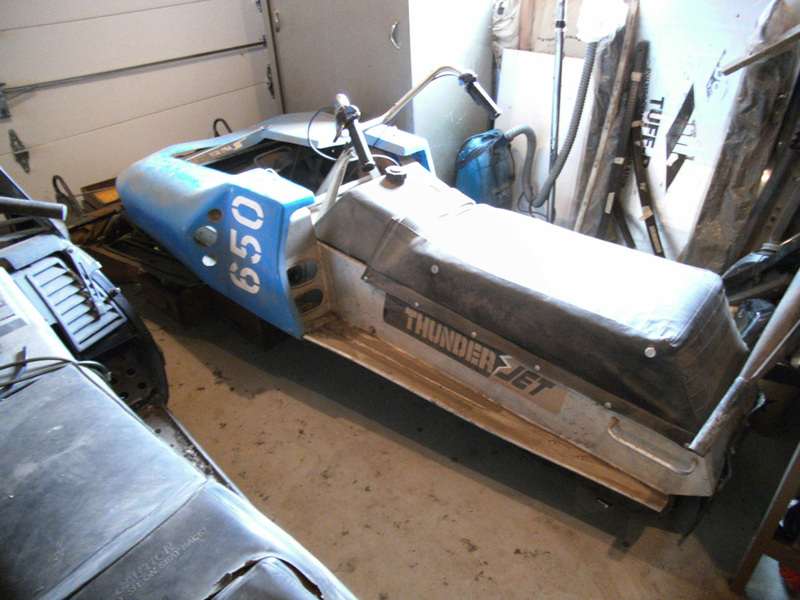 This Thunder Jet will remain as is, unused, and unstarted while it is under my watch as Buzzy took care of it under his. 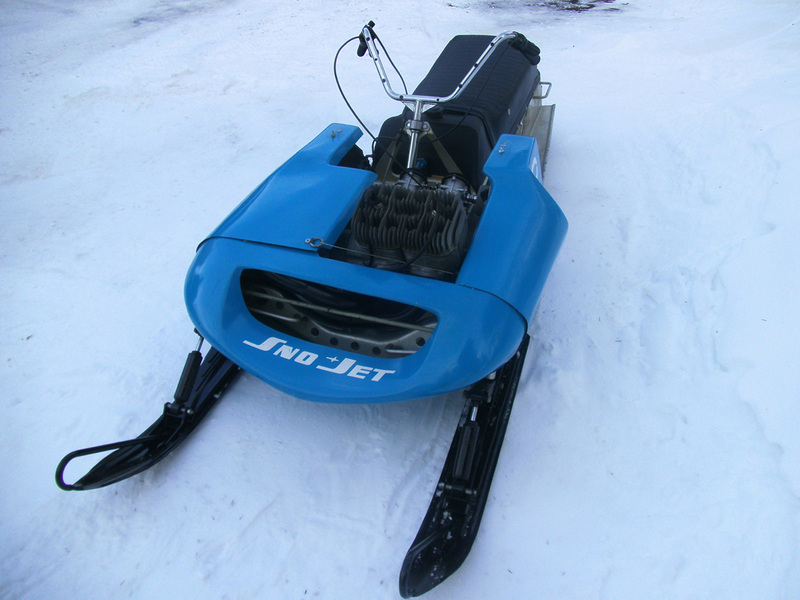 This one’s for you Buzzy and for all Sno-Jet lovers. Jim Adema would be proud of you. Dreams do come true. I hope you have enjoyed this story. 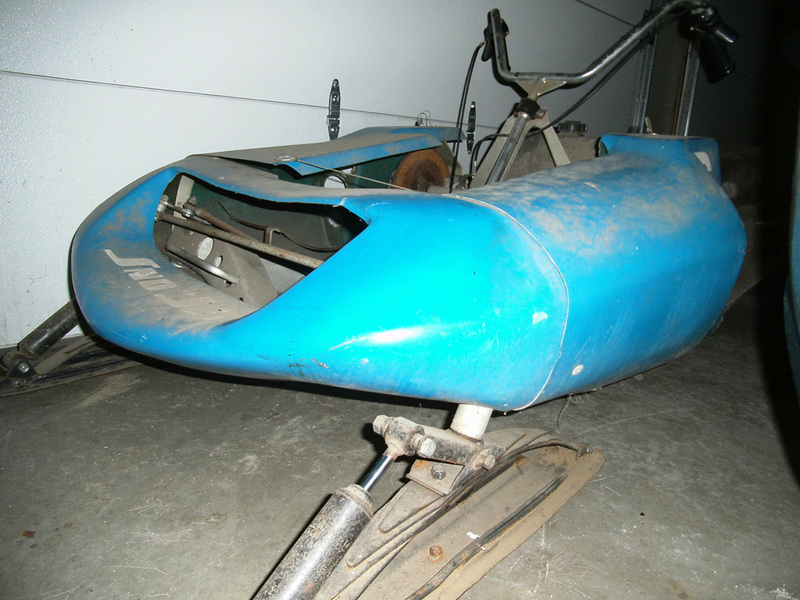 Here are some of the photos from when Paul picked up and the sled, prior to cleaning it all up.